It doesn't matter who "started" a trade war, you don't escalate. I hope you are not going to spend your time in the White House justifying Trump's bad policy instead of trying to educate him. China didn't start it. US politicians, NGOs, and all involved in trade deals did in a way. They decided on trade deals where China got to keep various domestic protectionist taxation and regulation. That's because US big business wanted access to cheap labor in China and Chinese big business wanted access to US markets but not without risking their domestic market. Everything worked as it was designed to work. One of the rules of power, never out shine the master. 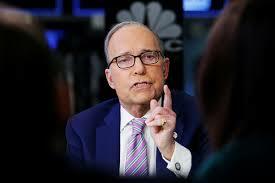 Kudlow would be moronic to publicly 'educate' the president. This trade war/escalation with China has been brewing for a long time. Maybe this is just another manufactured problem the Repubs can 'solve' just before Mid terms.